The Recipes are from our customers and friends that they actively use and enjoy. 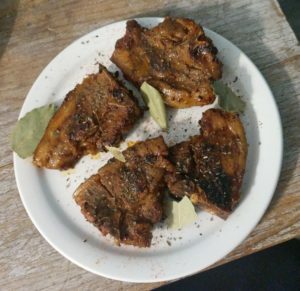 This is our second lamb chop recipe from customer, RoRo’s a la carte restaurant in Hensall. Add to taste: fresh garlic, ginger, salt and pepper. If desired, add hot chillies and hot pepper. This first one is from Lorna Bycraft. 1. Heat oil in a large frypan over high heat.Brown chops about 30 seconds per side.Remove meat from pan. 2. Reduce heat to medium-high. Stir cranberry juice, wine, butter and lemon juice into the pan.Cook, stirring occasionally until liquid is reduced by half, about 20 minutes. 3. 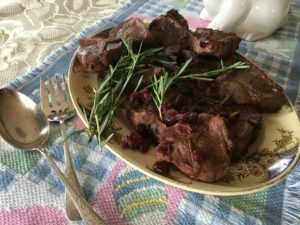 Return meat to pan, add dried cranberries, rosemary and honey, if using.Continue simmering until meat is cooked to the desired degree of doneness (about three to five minutes per side for medium-rare).Add salt and pepper to taste.